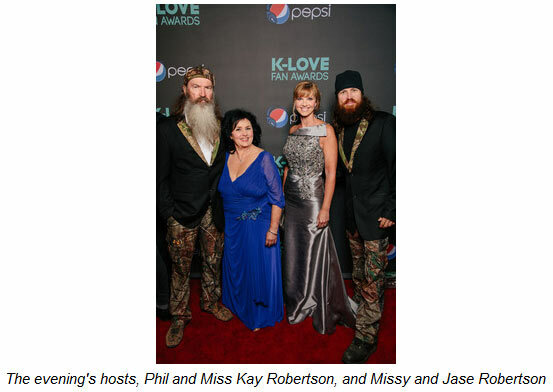 HOSTED BY STARS OF A&E TV's "DUCK DYNASTY"
4 June 2013 - Nashville, Tenn - Winners were announced on Saturday evening at the K-LOVE Fan Awards, the first ever fan-voted awards show in Christian music history. 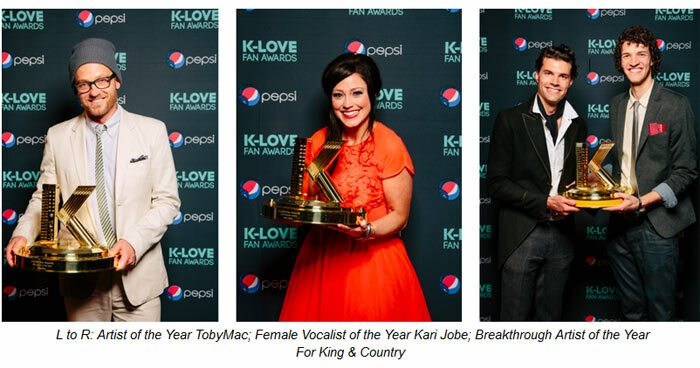 The K-LOVE Fan Awards were held in front of a sold out audience at Nashville's historic Ryman Auditorium and heard live on air on the K-LOVE radio network. The entire weekend, tapped as the Ultimate Fan Experience, sold out weeks earlier. This inaugural three-day event, which brought together the biggest names in Christian music, sports, books and movies, began Friday, May 31 and culminated yesterday, Sunday, June 2, highlighted by Saturday's Awards show. Numerous and unforgettable performances, appearances and interviews were held throughout the evening. Highlights were fan favorites such as TobyMac, Amy Grant and Steven Curtis Chapman, Michael W. Smith who performed with Missy Robertson of "Duck Dynasty," Third Day, Matthew West, Casting Crowns, Natalie Grant with Kari Jobe, Audio Adrenaline, Newsboys, Matt Maher with Brandon Heath and Bart Millard of MercyMe, Francesca Battistelli, and so much more. Special Q&A's were held throughout the evening with sports figures, including Mike Fisher, Hugh Freeze, Alfred Morris, Barrett Jones and Jason Hanson. 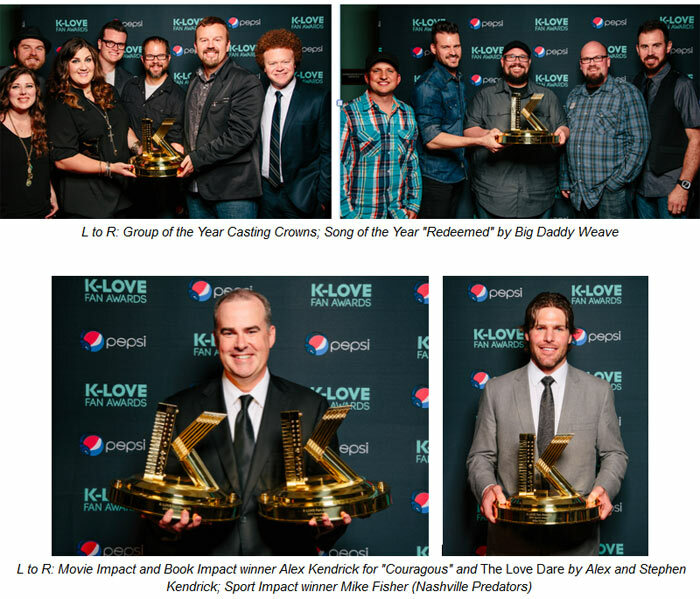 "The hope of the K-LOVE Fan Awards was to have the fans acknowledge members of the Christian community for their impact of serving the Kingdom through their lives," shares Mike Novak, K-LOVE's President & CEO. "By all measure, it was a huge success!" K-LOVE's Chief Creative Officer David Pierce adds, "It was awesome to see the creative and sports communities come together and celebrate excellence that impacts our culture for Christ. Each of our nominees and performers brought their incredible God given talents while connecting with our amazing fans!" The K-LOVE Fan Awards mission was to create a fan experience that celebrates and promotes artists, athletes, authors and entertainers who, with excellence, engage and impact popular culture for Jesus Christ. Surrounding the K-LOVE Fan Awards was the Ultimate Fan Experience, with Nashville's famed Gaylord Opryland Hotel & Resort as the home base. The fans who joined this experience received tickets to the Awards show, a two-night stay at Opryland, dinner with the K-LOVE staff and friends, a weekend kick-off concert, an exclusive meet & greet, and much more. The 2013 K-LOVE Fan Awards and Ultimate Fan Experience was a John Sanders LLC/World Hope Event and was presented by Pepsi along with World Vision. The 2nd Annual K-LOVE Fan Awards is slated for June 1, 2014. For more information, please visit KLOVEFanAwards.com. K-LOVE plays positive, encouraging contemporary Christian music with a message designed to draw people toward an authentic relationship with God while living out real life in the real world. The radio network has 446 signals in 47 states with an estimated weekly audience of 14 million. Now with their first-ever Fan Awards, their mission is to create a unique and fun fan experience that celebrates and promotes artists, athletes, authors and entertainers, who, with excellence, engage and impact popular culture for Jesus Christ.